My prowess as a Gator prognosticator (two weeks ago, I predicted they would fall to LSU) took a hit today. I'm sticking with my forecast of a loss to Auburn next week, especially because Auburn was upset badly by Arkansas today (ergo the Tigers will be hungry and primed for revenge, while the Gators will be cocky and overconfident); also, it's at Auburn and they have often been a nemesis for Florida. USF gets by UConn to even up their Big East record at one. Update: Gators are ranked No. 2? Y'all War Eagle fans can relax. The Florida players' heads will be swelled so big they won't even be able to get their helmets on. In an earlier post I mentioned that my daughter's favorite place in Tampa is the Florida Aquarium. Her favorite part of the Aquarium is the Wetlands exhibit. 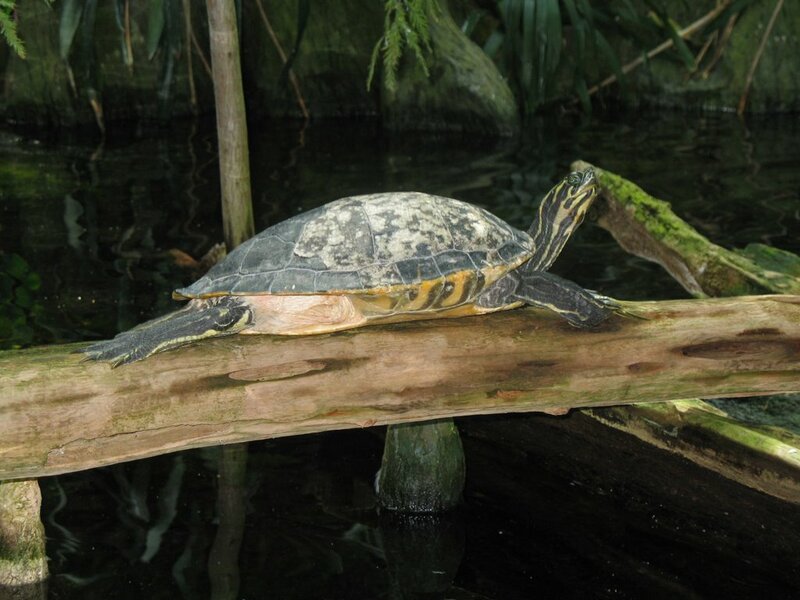 On our visit last Monday, in the Springs portion of the exhibit we found this peninsula cooter resting, but with head up and alert, on a fallen limb. 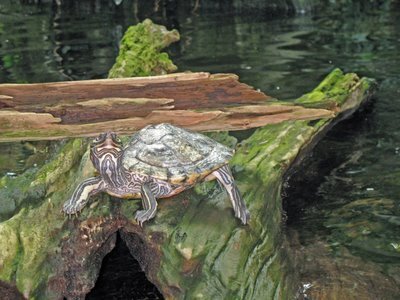 On a log below, this Barbour's map turtle seemed less than thrilled to be photographed. Note that, in the linked article about Barbour's, the writer describes the Apalachicola River basin as "heaven", which is interesting considering Elvy Calloway's conjecture that it was the site of the Garden of Eden (see my post on Senecas, etc., below, linked at the beginning of this post). A little futher along, Liz found and photographed this roseate spoonbill perched at the edge of the Mangrove Swamp sector. 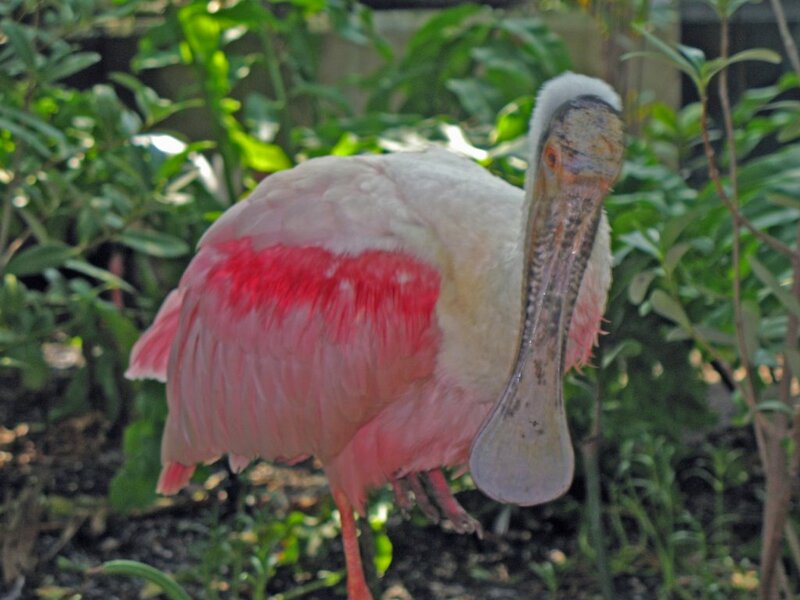 The plumage trade of the late nineteenth century put some stress on the spoonbill population, but these birds are, fortunately, now fairly common around parts of the Gulf of Mexico coastline. Unfortunately, the otters were snoozing in some dark recess of the exhibit. The gators were out, but difficult to photograph because of the high plexiglass walls separating them from visitors' fingers. Si and I were neighbors for many years. When I moved to Brooklyn Heights in 1983, he was living in my building. Si was an architect, and designed the rooftop deck on which my family, friends and I enjoyed many sunsets and Fourth of July fireworks displays. He was an outgoing, friendly man with a winning smile. Besides an interest in architecture, something Si and I had in common was smoking. Some years ago, he began to lose his voice. Then I learned he had been diagnosed with throat cancer, and would need surgery. A month or so later, I was standing in front of our building having a cigarette when Si walked up to me and whispered, "You've got to quit that if you don't want to end up like me." His larynx had been removed, and with it his voice. Si's advice weighed heavily with me: I quit cold turkey a few months later. For the past few years, I would see him now and then (he had moved, but stayed in the neighborhood), and occasionally have a short chat - the most he seemed able to manage, as even whispering was evidently a strain on his throat. He was delighted when I told him I'd stopped smoking. Usually, I would see him on nice days, sitting at a table outside Starbucks on Montague Street. He would always give me a smile and a wave. Today I heard from a neighbor that Si died. I'll miss him very much, and always be grateful for his advice. Walking from my daughter's school to my office this morning, I took the long way, by the Battery Park City esplanade. 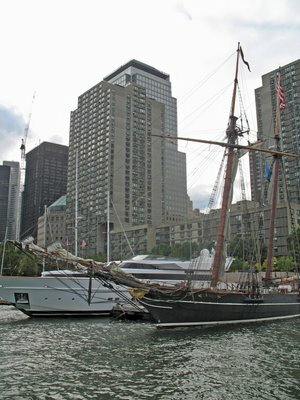 When I got to the North Cove yacht basin, I saw an antique-looking vessel docked at the southwest corner. She proved to be a replica of the slave ship Amistad, probably the one used in the movie of the same name. 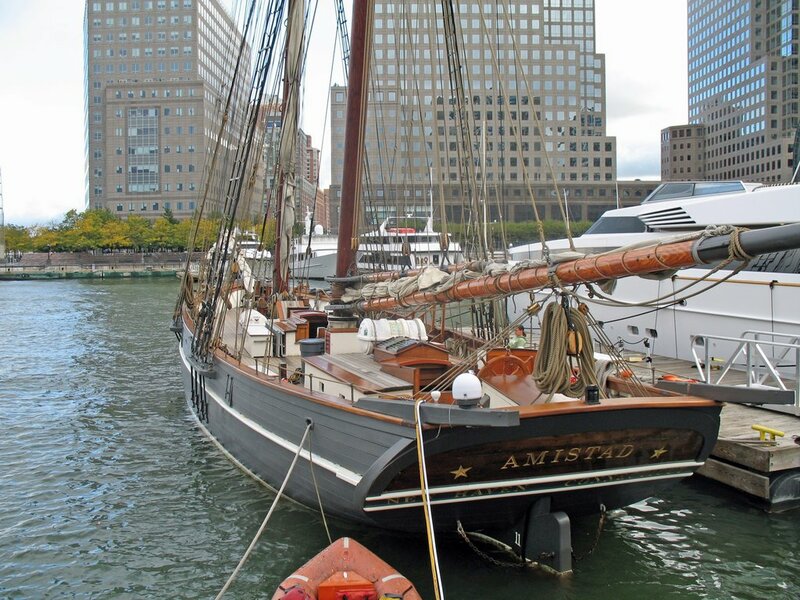 Ironically, slavers were among the most beautiful of ships, as this view of Amistad's long bowsprit, graceful hull and aftward-raked masts shows. Those built after the slave trade was outlawed were made small and speedy so as to evade detection by, and outrun if necessary, patrolling warships. Speed was also of the essence because their human "cargo", chained below decks, was altogether too perishable. Every now and then, I'll encounter several things in my reading that are connected in some odd way, despite having been published at different times and in differing contexts. On Saturday, we flew to Tampa to be with my mother as she celebrated her 90th birthday. Early that morning, gathering reading material for the flight, I saw on the front page of the Sunday New York Times travel section (which is delivered on our doorstep with our Saturday paper) a teaser for an article on page 13 by Beth Quinn Barnard, headed "Seneca Folklore And Forest Trails - A ravine near Canandaigua, N.Y., is called the world's birthplace." I stuck the travel section in my carry-on bag because I spent a good deal of time in the early part of my career in Seneca country, western New York State, and I'm interested in the creation myths of various cultures. According to the article, the Senecas, or Onondowaga ("People of the Great Hill") as they call themselves, believe their progenitors to have emerged from the earth at a place now called Clark's Gully, a ravine at the base of South Hill ("Nundawao" to the Senecas), an eleven hundred foot eminence at the southern end of Lake Canandaigua. Thinking about Seneca legends made me recall conversations I'd had many years ago during my travels in Western New York. One of these had concerned a Spiritualist community called Lily Dale, near the village of Cassadaga in Chautauqua County, southwest of Buffalo. (There's a song called "Lilydale" on The Wishing Chair, the magnificent first album by 10,000 Maniacs, who came from nearby Jamestown, New York; you can hear it here.) During this conversation, I was told about a young man from Jamestown who had Seneca ancestry, and who visited one of the mediums at Lily Dale. When he entered the room where the medium sat, she seemed to look over one of his shoulders, and said, "Hello! I haven't seen you in a while. How are you?" Realizing this wasn't addressed to him, the young man remained silent for a minute while the medium seemed to listen to an inaudible reply. Finally, she looked him in the eye, and he said, "Who were you talking with?" "It's Cornplanter," she answered. "He says you're one of his favorite grandsons, and he keeps a close watch on you." The Seneca creation myth also made me recall that, when my parents and I were moving from Eglin Air Force Base, in the western panhandle of Florida, to Tampa, we passed billboards on the highway west of Tallahassee urging us to turn off and see "The Original Garden of Eden". I later did some research on this, and found that a Baptist minister in that area, Elvy Calloway, had declared that a ravine on the Apalachicola River had to be the Biblical Eden. He reached this conclusion for various reasons, including the fact that the River splits into four branches nearby, and that various plants mentioned in Genesis can all be found growing there. On Monday, I took my daughter to her favorite place in Tampa, the Florida Aquarium. (At age 12, she aspires to be a marine biologist. Oddly enough, I had exactly that ambition when I was her age. I'm hoping she'll stick with it.) As we surveyed the gift shop after our tour, I spotted a book with the title Weird Florida, by Charlie Carson (Sterling Press, New York, 2005). I opened it to see if it had an account of the "Garden of Eden". It did, and, to my surprise, a few pages away had a piece about a spiritualist community in Volusia County (near Daytona Beach) called Cassadaga. I assumed Cassadaga, Florida was founded by people who moved south from Lily Dale, since it bears the name of the New York village nearest to there. However, according to Weird Florida, the founder was a spiritualist from Iowa who, in 1875, contacted a Native American spirit. This spirit first directed him to visit another spiritualist in Wisconsin, then told them both that they were to found a spiritualist community in Florida. They traveled to Florida, where the spirit gave them precise directions as to where to establish the settlement. So, nothing to do with Western New York, except that the spirit guide's name was "Seneca". Update: I looked up the website for the Cassadaga, Florida spiritualist community, and found that George Colby, the founder, although he may have come there from Iowa, was "from New York". So, perhaps he grew up in or near the original Cassadaga.